Humboldt County is a county in the U.S. state of Nevada. As of the 2010 census, the population was 16,528. Its county seat is Winnemucca. Humboldt County comprises the Winnemucca, NV Micropolitan Statistical Area. Humboldt County is the oldest county in Nevada, created by the Utah Territorial Legislature in 1856. It was also one of Nevada's original nine counties created in 1861. 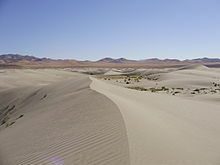 The county is named after the Humboldt River, which was named by John C. Frémont, after Alexander von Humboldt, a German naturalist, traveler and statesman. Humboldt never saw the places that bear his name. Unionville was the first county seat in 1861 until the mining boom died there and it was moved to Winnemucca on the transcontinental railroad line in 1873. The county was the site of an arrest in 2000 that led to the U.S. Supreme Court decision Hiibel v. Sixth Judicial District Court of Nevada in 2004. According to the U.S. Census Bureau, the county has an area of 9,658 square miles (25,010 km2), of which 9,641 square miles (24,970 km2) is land and 17 square miles (44 km2) (0.2%) is water. It is Nevada's fourth-largest county by area. The Santa Rosa Range runs through eastern Humboldt County. The highest point in the county, 9,731-ft (2966 m) Granite Peak, is in the range. The most topographically prominent mountain in Humboldt County is unofficially known as Dan Dobbins Peak and is in the remote Jackson Mountains. As of the census of 2000, there were 16,106 people in the county, organized into 5733 households, and 4133 families. The population density is 2 people per square mile (1/km²). There are 6,954 housing units at an average density of 1 per square mile (0/km²). The racial makeup of the county is 83.21% White, 4.02% Native American, 0.57% Asian, 0.51% Black or African American, 0.07% Pacific Islander, 8.54% from other races, and 3.09% from two or more races. 18.87% of the population are Hispanic or Latino of any race. There are 5,733 households out of which 40.9% have children under the age of 18 living with them, 59.6% are married couples living together, 7.6% have a female householder with no husband present, and 27.9% are non-families. 22.8% of all households are made up of individuals and 6.3% have someone living alone who is 65 years of age or older. The average household size is 2.77 and the average family size is 3.28. In the county, the population is spread out with 31.40% under the age of 18, 7.50% from 18 to 24, 31.20% from 25 to 44, 22.30% from 45 to 64, and 7.50% who are 65 years of age or older. The median age is 33 years. For every 100 females, there are 110.30 males. For every 100 females age 18 and over, there are 110.20 males. The median income for a household in the county is $47,147, and the median income for a family is $52,156. Males have a median income of $44,694 versus $25,917 for females. The per capita income for the county is $19,539. 9.70% of the population and 7.70% of families are below the poverty line. Out of the total population, 10.40% of those under the age of 18 and 10.80% of those 65 and older are living below the poverty line. As of the 2010 United States Census, there were 16,528 people, 6,289 households, and 4,316 families residing in the county. The population density was 1.7 inhabitants per square mile (0.66/km2). There were 7,123 housing units at an average density of 0.7 per square mile (0.27/km2). The racial makeup of the county was 79.0% white, 4.2% American Indian, 0.7% Asian, 0.5% black or African American, 0.1% Pacific islander, 12.7% from other races, and 2.8% from two or more races. Those of Hispanic or Latino origin made up 24.4% of the population. In terms of ancestry, 15.0% were English, 14.6% were Irish, 14.1% were German, and 5.1% were American. Of the 6,289 households, 36.3% had children under the age of 18 living with them, 53.2% were married couples living together, 8.9% had a female householder with no husband present, 31.4% were non-families, and 25.6% of all households were made up of individuals. The average household size was 2.60 and the average family size was 3.13. The median age was 36.2 years. The median income for a household in the county was $55,656 and the median income for a family was $69,032. Males had a median income of $56,843 versus $33,531 for females. The per capita income for the county was $25,965. About 7.8% of families and 12.0% of the population were below the poverty line, including 17.3% of those under age 18 and 4.6% of those age 65 or over. Humboldt County School District serves Humboldt County. There have been at least two allegations of abuse of civil forfeiture by Humboldt County Sheriff's deputy Lee Dove. Both cases were won by the civilians in question, albeit at great personal expense. 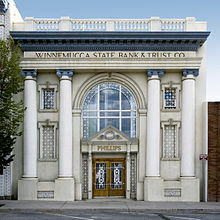 Winnemucca is the sole incorporated city in the county. ^ a b "State & County QuickFacts". United States Census Bureau. Retrieved August 5, 2014. ^ "County Explorer". National Association of Counties. Retrieved June 7, 2011. ^ Gannett, Henry (1905). The Origin of Certain Place Names in the United States. Govt. Print. Off. p. 163. Retrieved January 1, 2016. ^ "Brandon Flowers - Diggin' Up The Heart Lyrics". Directlyrics.com. Retrieved January 1, 2016. ^ "Granite Peak, Nevada". Peakbagger.com. Retrieved October 11, 2014. ^ a b c "DP-1 Profile of General Population and Housing Characteristics: 2010 Demographic Profile Data". United States Census Bureau. Retrieved January 21, 2016. ^ "Population, Housing Units, Area, and Density: 2010 - County". United States Census Bureau. Retrieved January 21, 2016. ^ "DP02 SELECTED SOCIAL CHARACTERISTICS IN THE UNITED STATES – 2006-2010 American Community Survey 5-Year Estimates". United States Census Bureau. Retrieved January 21, 2016. ^ "DP03 SELECTED ECONOMIC CHARACTERISTICS – 2006-2010 American Community Survey 5-Year Estimates". United States Census Bureau. Retrieved January 21, 2016. ^ O’Harrow Jr., Robert; Sallah, Michael (September 8, 2014). "They fought the law. Who won?". The Washington Post. Retrieved September 17, 2014. ^ Leip, David. "Dave Leip's Atlas of U.S. Presidential Elections". uselectionatlas.org. Retrieved April 12, 2018. ^ The leading "other" candidate, Progressive Theodore Roosevelt, received 533 votes, while Socialist candidate Eugene Debs received 339 votes. Wikimedia Commons has media related to Humboldt County, Nevada. This page was last edited on 1 December 2018, at 03:14 (UTC).